You might recall that last year we went completely over the top with our space themed party. That's how we like it though - totally crazy over the top. 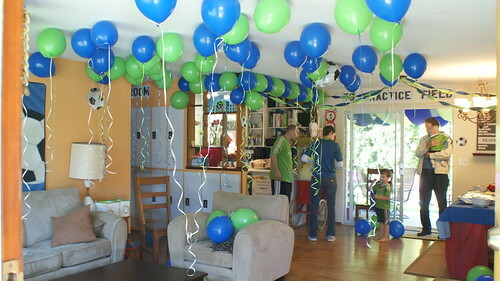 This year wasn't quite so nuts but we did have a lot of fun decorating for the Snickerdoodle's 4th birthday. 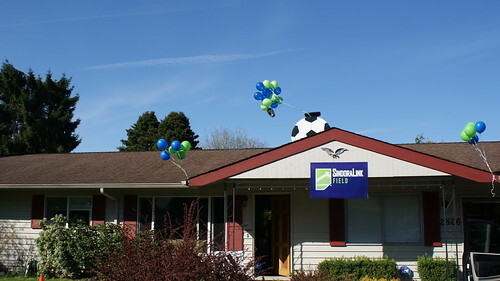 The theme was Seattle Sounders FC so we decided to convert the house into the stadium and the front and back yards into the playing field and practice field respectively. Here in Seattle, soccer is played at CenturyLink Field. I used a graphics designing software program to create a .png file with our version of the sign (our last name is Sindora . . . thus SindoraLink Field) then uploaded it to Vistaprint and used a group deal to have them create a huge outdoor banner for us for pretty darn cheap. BTW, if you've never used Vistaprint before, you MUST check them out for anything you want printed from t-shirts to signs to business cards. They always have great prices and I've never been disappointed with their products. Mr. BSR took on the chimney soccer ball project although I did the measuring and marking for the paint. That's actually the NASA sign from last year cut down a little. He primed over the previous painting and added the black. Nice work honey!! 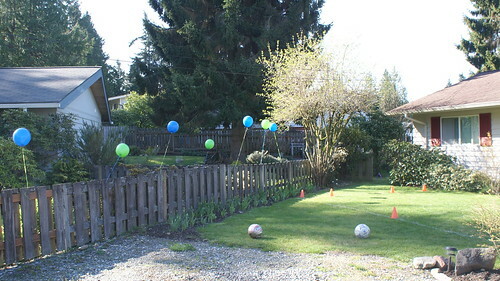 Look over to the left and you'll find our front yard has a mini soccer field spray painted on the grass (hard to tell and apparently I never got a good picture of it) and balloons along the fence. Later on, you'll even find some kids playing! Yep, that's the Snickerdoodle in action. I can't believe my baby is 4. We bought 2 Party Time helium tanks from Hobby Lobby using 40% off coupons (2 different weeks) making them around $20 per tank. 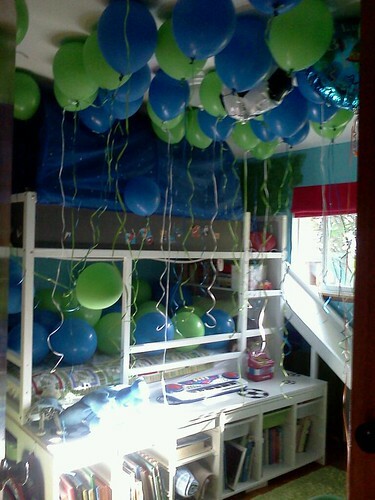 We ended up with a TON of balloons too, it was really fun! We hung up a cool Sounders throw blanket we had in the Snickerdoodle's room and I made a bunch of signs to put around the house. In all we had VIP Lounge, Locker Room, Restrooms, Kid Zone, To Practice Field and To Stadium. 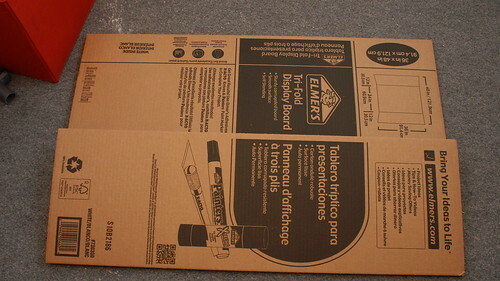 I just used basic stencils and some scrap cardboard. 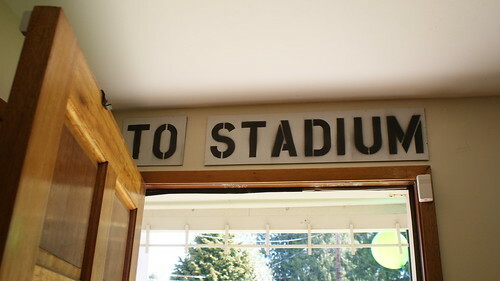 I wanted them to look a little rough since stadium signs are rarely fancy. 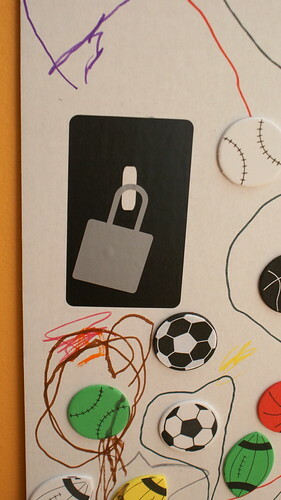 I also used my Silhouette to make a few signs for the doors we didn't want people going through. The one on our bedroom door (where the cat was stashed) just read "Aughorized Personnel Only" and the one on the door to the garage read "Coach's Office, Do Not Enter." 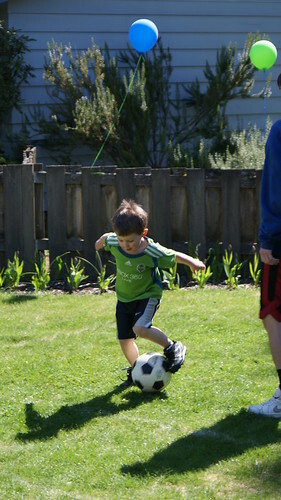 We decided the front yard was the stadium since that's where the real spray painted soccer field was. 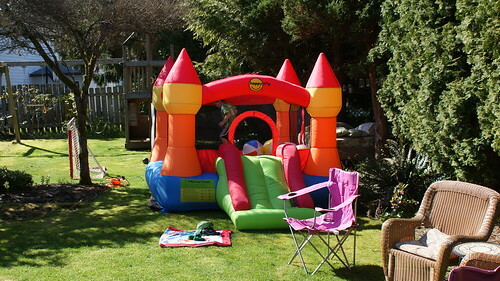 Out back we had the bouncy house and lots of fun games like shots on goal, dribbling and whatever else anyone wanted to do with the myriad of balls lying around our yard (nothing new there really). But come back inside first . 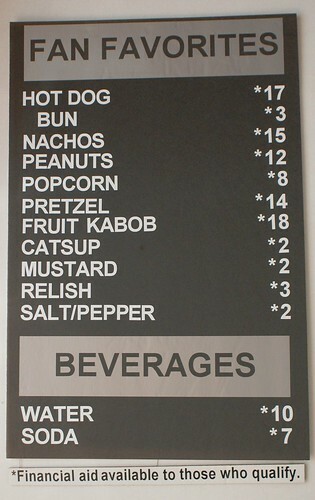 . .
We served ballpark food including hot dogs nachos, peanuts, popcorn (even had a popcorn machine), soft pretzels and fruit kabobs. That's black foam core board with white adhesive vinyl letters cut on my Silhouette. My very favorite decoration was the locker room though. We have a hallway running down the house towards the bedrooms and the wall was just begging for some major decor. I set out to the craft store and after chatting with one of the employees, she led me to the perfect product to make the locker room. Another project done on my Silhouette. 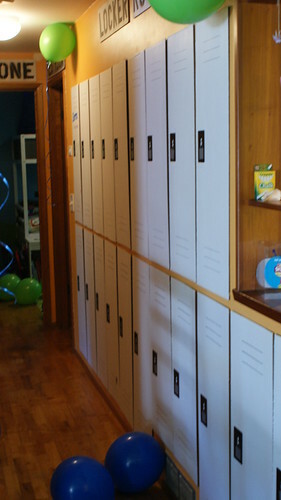 If you by chance want to do your own lockers and have a Silhouette, shoot me an email and I can send you the files. BTW, not all the locks were crooked, I did a few askew just for fun. Alright now back out to the back yard, this time looking back at the patio. 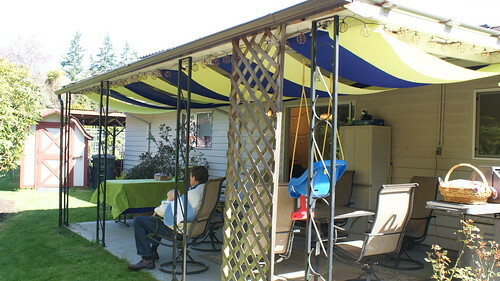 I saw something on Pinterest where they used these wide rolls of crepe paper inside the house to create a cool ceiling decoration but we just don't have any rooms that this worked for with 9 foot rolls of paper so we thought we'd put them up out on the patio. I loved this so much I've been looking for some good outdoor fabric that we can use out there permanently (that won't break the bank). I'm sure I'll post about it when I figure that out. I don't want to do green and blue though, I think I'll wait to see what colors pop up in our rose garden this year before I make any final decision. Do you like to do theme birthday parties? Do you go all out or keep it light and tasteful? I'd love to see what you've done so please feel free to include a link (or more) with your comment if you've blogged about your parties. One last thing - are you wondering what we did with the helium balloons after the party (we did send many home with the guests)? The Snickerdoodle was in heaven . . .
"Mommy, it looks like a forest in here"
Just stumbled across this post as my son is OBSESSED with soccer. 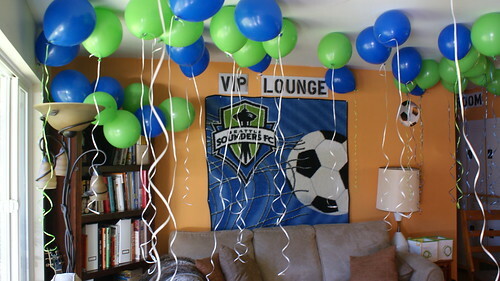 And my husband is OBSESSED with the Sounders. 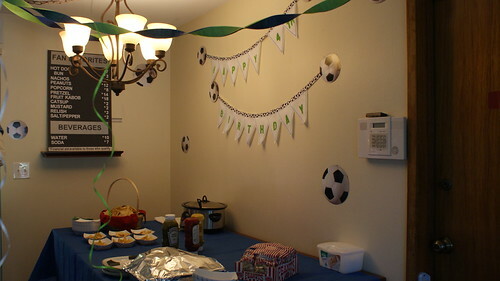 Totally doing a soccer themed bday party this year for the little guy. Thanks for some inspiration! is not your looks but the smile on your face that shows that it is your birthday.